This church is among many people's favourites in Suffolk, and so it is with some embarrassment that I must admit that I had never been inside until the summer of 2011. On my two previous visits I had found substantial building work in progress, on one occasion the replacement of All Saints's vast thatched roof. Now in the care of the Churches Conservation Trust, it is hard to imagine that all that care could have been afforded by the parish, especially as they had another church up the road at St James, and so in the 1970s All Saints was declared redundant. This is an ancient place. The Iceni, for whom the village is named, were a Celtic tribe, whose Queen Boudicca has become a national heroine. She it was who, in the 1st century AD, led the only successful rebellion against the Roman occupation. It is likely that the Iceni later embraced Christianity, but no trace of their worship survives; after the Romans finally left Britain after AD400, the Iceni were driven out of their homeland by the Saxons, who, of course, remain in Suffolk to this day. The Saxons were themselves later Christianised by St Felix, and this was probably the most densely populated area of England by AD700. An excavated Saxon village has been reconstructed nearby at West Stow. 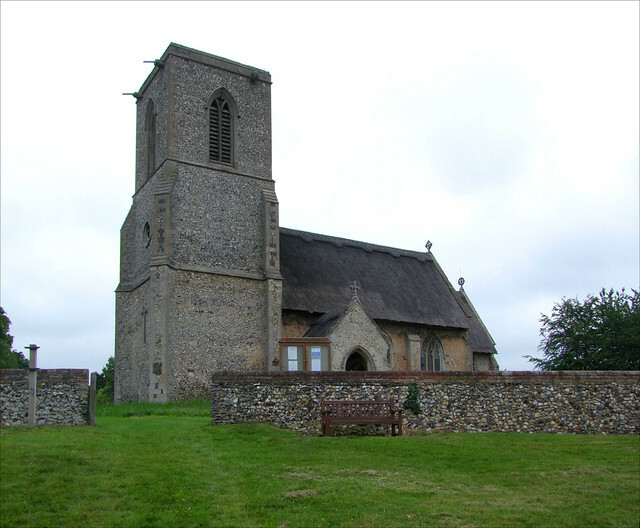 All Saints is one of Suffolk's great village churches, and is in a splendid condition now, thanks to the loving attention lavished on it by the Churches Conservation Trust. The hilltop site suggests that this may have been where the converted Saxons built their church, but nothing here is older than the 12th century work in the nave walls. Most of this church was rebuilt on a grand scale in the 14th and 15th centuries, but it still retains a rustic charm which seems to speak of that earlier age, although this may well be the CCT's clever sleight of hand. The church is usually open during the day, and if not there is a key available across the road at the pub. You let yourself in through a door on the north side, with a pretty handle made by some 19th Century blacksmith to represnt the virtues of Faith, Hope and Charity. You step into a space which is full of light thanks to the clear glass in most of the windows, looking across to a south aisle which is as wide as the nave and makes the interior appear square. Turning east, the chancel contains the largest expanse of medieval tiles in East Anglia. Geometric patterns are punctuated by lion faces and evangelistic symbols. The 15th Century benches in the nave are rather precarious, and it is hard to think that the bods from Health & Safety would be terribly happy about them being used for sitting on, but they do look lovely. The 19th Century benches across from them have a similarly rustic feel, quite a contrast with the urbanised clutter up the road at St James. The rood screen dado is 15th Century, though it was obviously altered to accomodate a pretty Jacobean gate two centuries later, at which date the pulpit was also installed. The font is 14th Century, and contemporary with the tiles and the glass reset in the south aisle. The figures appear to be Old Testament prophets, with perhaps two disciples looking out of the window-like arcading of their panes. It is rare to find quite such an assemblage of 14th Century fittings in East Anglia, and one can only presume that they date form the original rebuilding of this church. This is such a super church that you can't help thinking the parish missed a trick allowing it to be declared redundant. This wide open space cries out for oil lamp and candle-lit evensong, for Christmas carols and Easter morning, and for that most characteristic of 19th Century Anglican inventions, the harvest festival. Instead, your footsteps echo in the silence as you step through the emptiness.